Books serve many purposes. They encapsulate the learning of many generations. They carry forth the history and culture of a people. Big, heavy tomes can even act as door stops! Books entertain and educate. Scholastic has brought out a new series that falls squarely in the ‘books that educate’ category. The series, entitled “I Am…”, presents the biographies of famous men and women in an easily comprehensible fashion. The author has researched well, and presents the facts of Einstein’s life simply. We learn that he was not a willing student, but he was an enthusiastic thinker. His father presented him with a compass, and explained why the needle always pointed north. Einstein was fascinated. “Where did the magnetism come from and how did it get into their house?” Fourth grade readers may well ask their own simple questions, and discover profound truths. Would Einstein have spoken of himself as the introduction would have us believe, “my legendary curiosity”, “the most famous scientist of all time”? Perhaps not. He was of a shy and retiring nature. Sidebars present additional information. 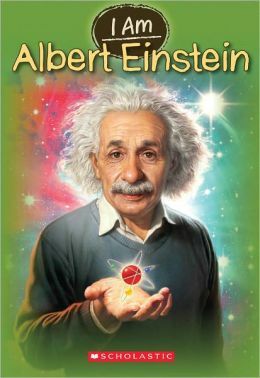 In this book the sidebars cover a brief history of physics, present the basic principle of nuclear fission and describe very briefly the four papers Einstein wrote during his ‘Miracle Year’. Maps, timelines, additional facts and a glossary make this an excellent book, and series, for young readers conducting their own research for their schoolwork.